Supported Employment enabled jobs are now provided throughout the country by many employers to enable people that have learning disabilities to enter the world of work. People that have learning disabilities are proving themselves over and over again to be reliable and motivated staff. These are qualities that all employers seek from their workforce. Many Employers are facing recruitment difficulties, therefore Co-Options act to bring Employers and people with learning disabilities together, for their mutual benefits. 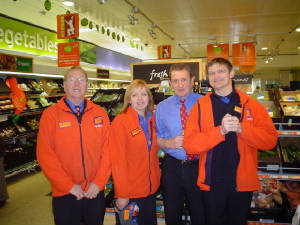 We do this by providing a comprehensive service to the Employer and to people with learning disabilities. We employ staff we call Job Coaches to help employers. The role of Job Coaches is to provide the crucial link between our service users and employers. The Job Coach will then research and approach employers with a view to negotiating possible opportunities. When employed, the service user support needs will continue to be met by the Job Coach within the workplace for as long as deemed necessary. Support will be gradually withdrawn and the new employee’s progress monitored on a regular basis.